The moated island was made about 1260 and parts of the Hall are medieval, but most of it was built by Humphrey Pakington about 1580. Many rooms have their orignal Elizabethan wall paintings. Humphrey Pakington was a catholic, the Hall contains the best surviving series of priest holes in the country. Four of them seem to be the work of the master-builder of hides, Nicholas Owen, who was arrested at Hindlip, near Worcester, in 1606 and tortured to death in The Tower of London. Nevertheless, Humphrey held a post in the household of Lord Chancellor Ellesmere and the family letters refer to politics, London fashions and rare plants acquired from the royal gardener Tradescant, as well as to coach mares, the bribing of juries, medical treatment and lamprey pies. In 1696, on the death of Humphrey's daughter Mary, Lady Yate, Harvington was inherited by the Throckmortons of Coughton in Warwickshire who demolished two sides of the courtyard and made minor alterations elsewhere. In 1743 they replaced the old domestic chapel by a larger one in the garden, which was restored in 1986-87 with a Georgian altar and chamber organ. The present church, which contains a Regency organ and a fine modern bronze by Faith Tolkien, was built by the Throckmortons in 1825. 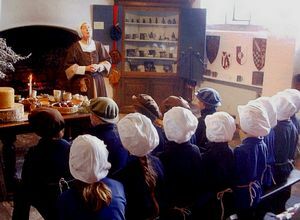 The Georgian church then became the village school. Later in the 19th century, the Hall was stripped of furniture and panelling and the shell was left almost derelict. In 1923 it was bought for the Roman Catholic Archdiocese of Birmingham which restored it and opened it to the public. Among other activities, it is now the centre of a music festival every July and of a pilgrimage every September. Since the Hall has been little altered since the early 18th century, it is an ideal site for teaching Tudor and Stuart history in accordance with the National Curriculum. Harvington Hall is 3 miles south east of Kidderminster, about half a mile east of A450 from Birmingham to Worcester and about half a mile north of A448 from Kidderminster to Bromsgrove.